Baby Bo Lux’s Wonder Week has her so wide-eyed she can hardly sleep… correction: we can hardly sleep. As a new mom with a business to run, I am more aware of my limited energy and brain capacity than ever. Knowing these resources are finite daily, I’ve set out to learn how to maximize them. Today’s post will help you do just that. In Baby Bo’s world, this is week 19—what they call a “wonder week”. Her senses are sharper than ever and she’s starting to comprehend her environment in a new, more intense way. Because her little head is reeling with new things, sleep has been tough. For all of us! Just like our bodies weaken (wilted into the sofa at the end of a long day) so too does our mental capacity. So yeah, I treasure my physical and mental energy and aim to be deliberate about my heavy lifting. Don’t leave your email open to be checked haphazardly. Don’t check your email first thing in the morning. Sound too simple to be valuable advice? Read on and be amazed, Friendo. The part of your brain responsible for making decisions, processing large amounts of info and controlling your impulses is the prefrontal cortex. It is a voracious sucker of your resources, namely glucose. Because you have a limited amount of resources, your ability to put your prefrontal cortex to good use is limited too. Which is to say: you can’t make good decisions all day. Make one, and your ability to make more is reduced. It’s a bank and you’re withdrawing from it every time you make a choice. Budget this resource, because not all choices are worth your energy. Email checking is a big sucker of this resource. Infact, constantly checking email reduces mental capability by an average of 10% on an IQ test. That’s an average of 5% in women and 15% in men. 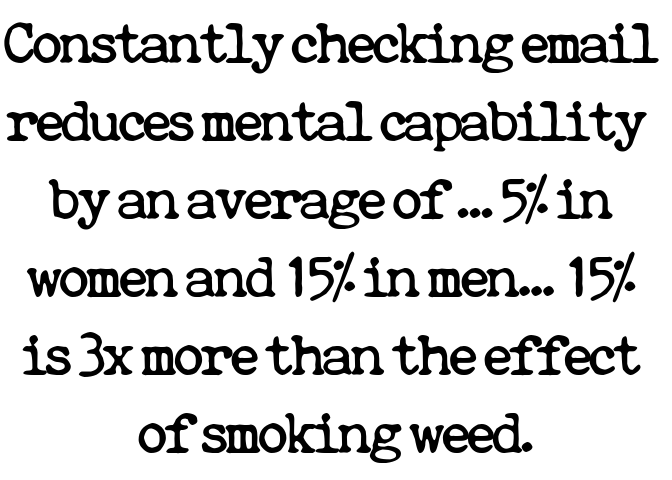 By the way, 15% is 3x more than the effects of smoking weed. Plus, if you’re always available to answer emails, people expect you to immediately answer their emails. And they’ll give you more emails to answer. Batch your emails. Choose when you’re going to check them by prioritizing your day’s events. Even better: train people to only expect responses at certain times of the day (or certain times of the day every couple days!). You can do this by always answering emails at the same time or by including a note in your email signature. On Sunday or Monday, prioritize your tasks for the week. Prioritizing is an even bigger drain of brain power than checking emails, so be sure to get your plan on paper to avoid having to do it again. Even though prioritizing requires a lot of energy, planning your days out this way will optimize what you can get done. Start with the most important complicated task, everyday. Did you find something in this post helpful? Is there something you’re going to try? Have a question? I’m all ears! Please share!